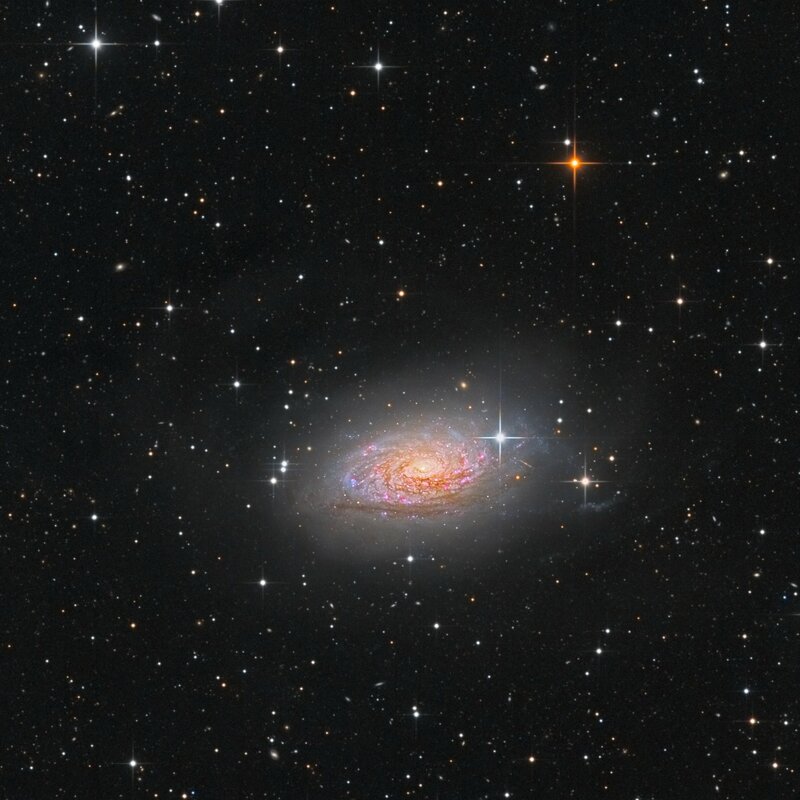 Messier 63 (M63), also known as the Sunflower Galaxy, is a spiral galaxy located in the northern constellation Canes Venatici. The Sunflower Galaxy lies roughly 37 million light years from Earth and has an apparent magnitude of 9.3. 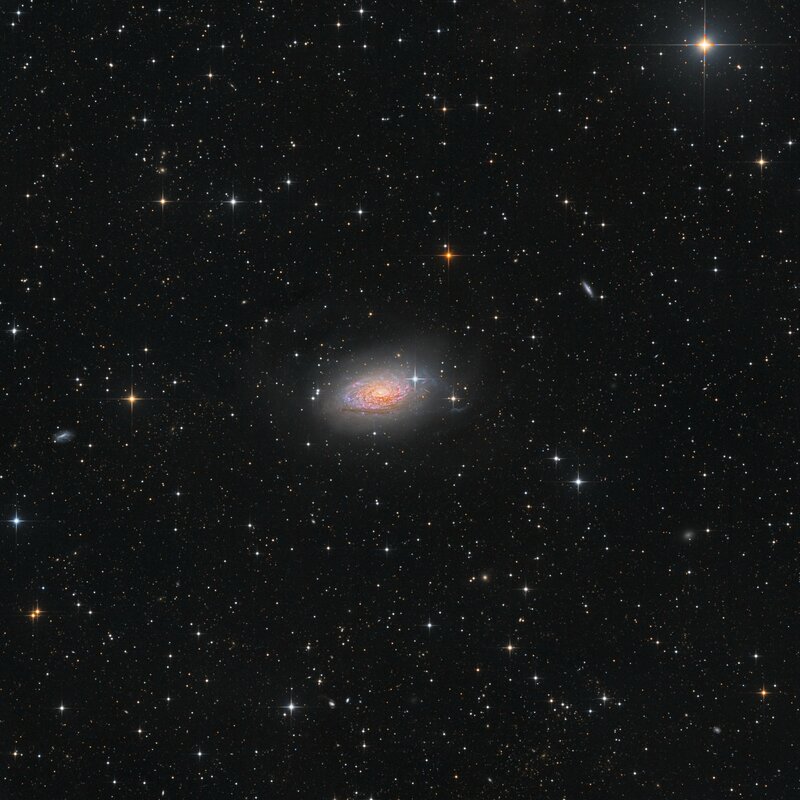 Its designation in the New General Catalogue is NGC5055. Messier 63 occupies an area of 12.6 by 7.2 arc minutes, which corresponds to a spatial diameter of 98,000 light years. This makes the galaxy roughly the same size as the Milky Way. M63 has a mass 140 billion times that of the Sun. In this picture there are hints of a very faint, giant arc-loop feature in the halo of the nearby spiral galaxy M63 (top left). This feature is the stellar stream of a disrupted dwarf satellite galaxy. It was first detected in 1979. This discovery is part of an increasing body of evidence that the growth of large spirals by cannibalizing smaller galaxies is commonplace in the nearby Universe. That’s a great shot, love the colors and your processing!